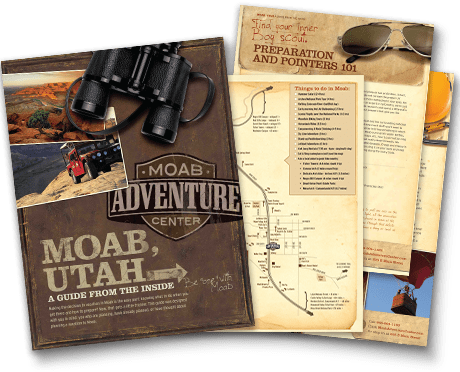 Moab is celebrated for it wide array of 4x4 and backcountry trails. People from all over the world congregate to tackle the challenges of some of off-roading’s most difficult obstacles. If you’re not an avid off-road enthusiast, don’t be intimidated, there are plenty of easy, beginner trails for you to explore. You don’t even need your own vehicle, we can help line you out with a capable and reliable rental. One of the most popular and iconic trails in Moab. It offers a wide range of obstacles and amazing views of slickrock domes and the La Sal Mountains. The route begins at HWY 279, Potash Road. At the end of the highway, you start the ascend toward Canyonlands National Park on a narrow old-mining road. You’ll get to enjoy incredible views of the Colorado River, Thelma and Louise Point, and the La Sal Mountains. Not for the faint of heart and who is afraid of heights and roads near cliffs. This trail is just north of Arches National Park and overlooks the park and the Klondike Bluffs. Watch for dinosaur prints along the trail. If this trail is wet, it can be more difficult than when dry. This trail is surrounded by red rocks and is an easy well-maintained off-roading trail, only 30 minutes from Fisher Towers, a spectacular hiking trail. Be cautions of flash floods as they can wash out parts of the road. Approximately 20 miles round trip from Hwy 128. Scenic trail in the La Sal Mountains. Mount Peale can be seen from this trail, as well as parts of Canyonlands National Park and Spanish Valley. Perfect for a summer picnic day. Please note that this area may close in winter due to snow. Suitable for most high-clearance SUVs. Close to Mill Canyon Copper Mill, halfway Station, and Mill Canyon Dinosaur Trail. This trail starts just a few miles from downtown Moab and goes along the South side of the Colorado River until the it reaches the Colorado River across from Dead Horse Point. Spectacular scenery throughout the trail. Trail ends at the iconic Gemini Bridges with beautiful viewpoints and overlooks. The start of this trail is approximately 48 Miles from Moab and only 14 miles are off road. The trail starts on the south side of the Colorado River and reaches the boundary with Behind the Rocks Wilderness Study area. 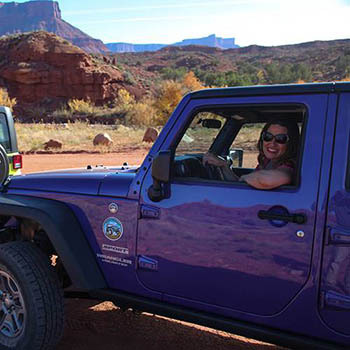 You will enjoy incredible views of the Colorado River, Moab Valley and the La Sal Mountains. Allow 1.5 hours to reach the top of the rim and back.